The 2018-2019 Programme available as a PDF file here. 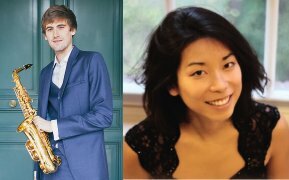 and for the 2nd March concert the Beethoven Piano Trio will be Op.11 in B flat major. Alexandra delighted our audiences when she appeared here in 2017 with Ugne Tiskute. This year she opens our season with a lovely, varied programme, and closes it when she returns as part of Ensemble Mirage. An evening of wonderful music which will take the audience around the world, and time travelling from early music to the present day, with both transcribed music and pieces composed for the saxophone. Kindly supported by Making Music's Philip & Dorothy Green Award for Young Concert Artists scheme. Jonathan is also a YCAT finalist for 2018. Viv McLean and Martyn Jackson have both given wonderful recitals for the Club in the past and we look forward to hearing them in this Ensemble playing three great works from the chamber music repertoire. 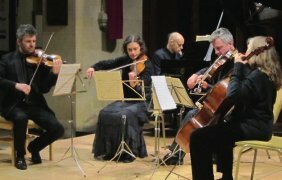 The Ensemble's programme features three great chamber music works. The bright and boisterous "Hunt" quartet is one of the works that led Haydn to say that Mozart "was the greatest composer he had known" whilst the Piano Quintet is regarded as one of Schumann's finest works and one which changed the format for ever. We are delighted to welcome back three young musicians whose individual performances at the club have been greatly enjoyed. As a Trio, their programme is based largely on Eastern European folk music including exciting works by Bartok and Khachaturian. Poulenc's Suite of Incidental Music for Jean Anouilh's play "L'Invitation au Château" is a rarely performed (because unpublished) piece and this is a great chance to hear it.